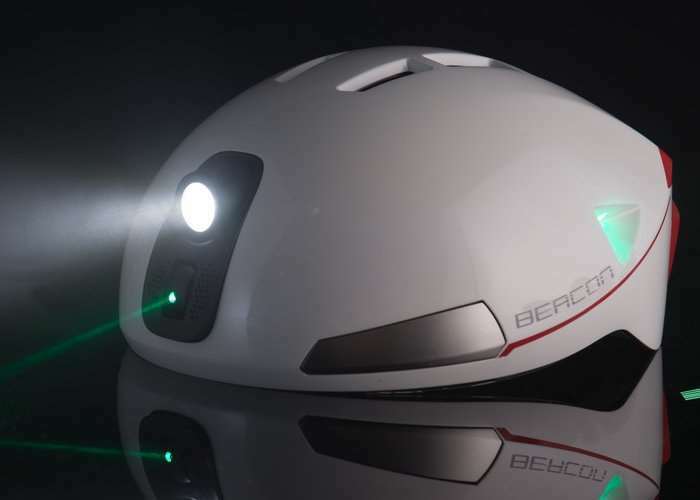 Cyclists looking for a helping hand to warn pedestrians and vehicles they are approaching or in their vicinity, may be interested in a new cycling helmet which has been equipped with three lasers and aptly named, the Beacon. Watch the demonstration video below to learn more about the Beacon cycling helmet which is equipped with indicator and brake light, front and rear LED, speakers and comes complete with its own companion smartphone application. Cyclists are not visible, especially at night. As a cyclist, I want to do something to make cycling much safer. According to government figure, 3,237 cyclists were killed or seriously injured in the UK in 2015 alone; in the US, 48,743 cyclists were killed or injured in 2013 alone. I believe a helmet of good innovation and design can help to prevent my fellow cyclists from getting hurt on the road. The patented Beacon Helmet projects a bicycle-shaped laser image 5 to 12 meters (16-39 ft) ahead of the actually position of the rider, greatly extending the road-footprint of the cyclist. By projecting a bicycle symbol in front, drivers and pedestrians become aware of the approaching bicycle beforehand and accident can be avoided. Beacon Helmet is now available to back via Kickstarter with early bird pledges starting from £180 and delivery expected to take place during April 2018. For full specifications and more information jump over to the official Kickstarter campaign page via the link below.